The Formetco VX4S and Pro HD are professional LED display controllers. Besides the function of display control, they also features in powerful front-end video processing. With high image quality and flexible image control, VX4S and Pro HD are able to meet the demands of all your media needs. 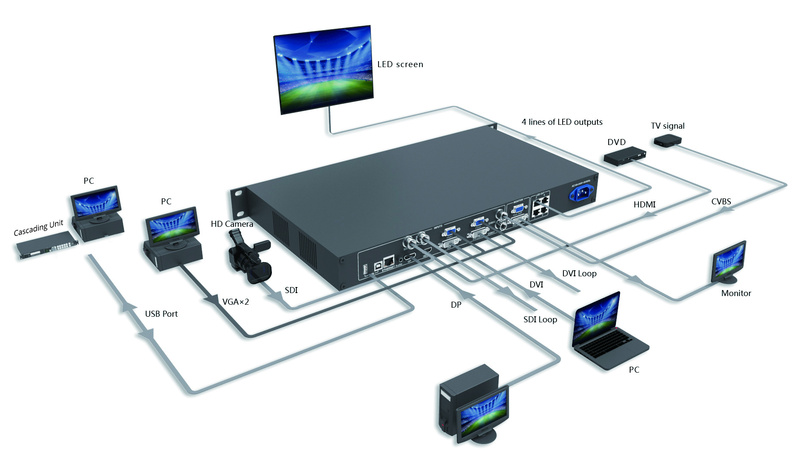 1) The inputs of the VX4S include CVBS×2, VGA×2, DVI×1, HDMI×1, DP×1 and SDI×1. They support input resolution up to 1920×1200@60Hz; the input images of VX4S can be zoomed point-to-point according to the screen resolution. 2) Provide seamless high-speed switch and fade-in/ fade-out effect so as to strengthen and display picture demonstration of professional quality. 3) The location and size of PIP can both be adjusted, which can be controlled at will. 4) Adopts the Nova G4 engine; the screen is stable and flicker-free without scanning lines; the images are exquisite and have a good sense of depth. 5) Can implement white balance calibration and color gamut mapping based on different features of LEDs used by screens to ensure reproduction of true colors. 7) 10bit/8bit HD video source. 8) The loading capacity: 2.3 million pixel. 9) Support multiple controller montage for loading huge screen. 10) Supports Nova’s new-generation point-by-point correction technology; the correction is fast and efficient. 12) Adopts an innovative architecture to implement smart configuration; the screen debugging can be completed within 30 seconds; greatly shorten the preparation time on the stage. 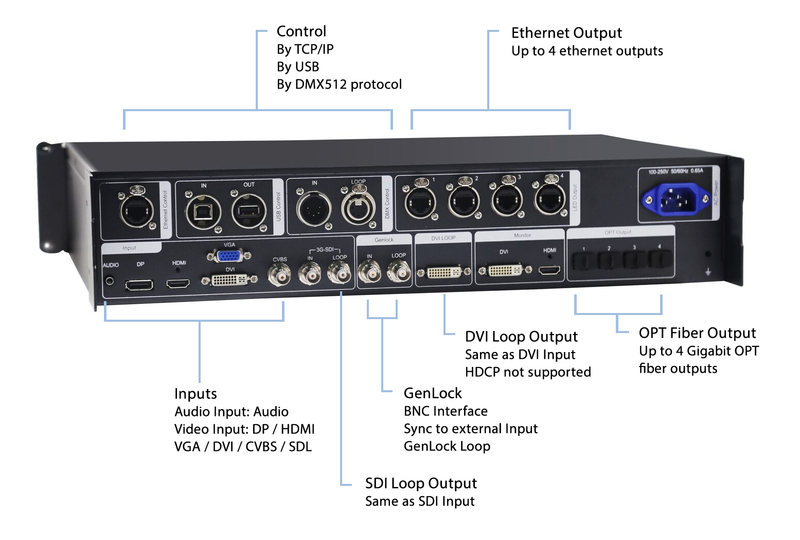 1) The inputs of the Pro HD include CVBS, VGA, SDI, DVI, HDMI and DP. They support input resolution up to 1080p@60Hz. Highest pixel clock is 165MHz. Output bandwidth is up to 4GBit. Advanced de-interlacing motion adaptive processing technology is adopted so that images are clear and fine. And with HDMI, the grayscale depth can be up to 12bits. 3) Computer software for system configuration is not necessary. The system can be configured using one wheel and one button. All can be done just by fingers. That is what we called Touch Track! You can also configure the system with browsers. This gives you the option of using a remote PC (Windows or Mac or Linux), a pad or even a smartphone to do the configuration. Real-time previews assist with system set-up and confirm source status. 4) The Pro HD has DMX512 and GenLock interface. Professional control and synchronization are ready to go. Optical fiber outputs enable the confident long-distance data transmission. 5) The Pro HD is the flagship product of our new generation controllers, powerful in processing, professional in control, and friendly in user-interface. Having a display to work has never been easier and more enjoyable as with Pro HD.